Berkshire Hathaway HomeServices is pleased to announce that Jonathan Ehlers is in his eleventh year as a broker. Jonathan’s enthusiasm for his career as a real estate broker is truly admirable. 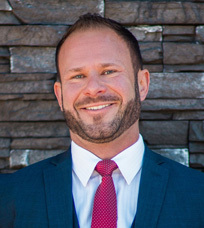 He works hard to provide his clients with the highest level of service, and to ensure they are being represented by a knowledgeable, professional expert. Jonathan says, “I chose a career in real estate because I have an interest in the market and a strong passion for working with people. The past ten years have been a wonderful learning experience, and it feels great to be doing business in the community I grew up." His previous work has included Project Manager and Investor for Hawaii Partners LLC and Property Manager for Ehlers’ Eye Center. After graduating from West Valley High School, he attended WSU, YVCC, and finished his education at the University of Hawaii at Manoa. Jonathan has been an award winning member of our team over the years, receiving the Professional Development Award in 2010, Honor Society in 2010, 2013, 2014, 2016, and in 2017 achieving the prestigious Leading Edge Society Award. He is the son of Dr. Rick and Debbie Ehlers, and now has his own family with his beautiful bride Jennifer and their three kids: Emma, Kaitlyn, and baby boy Kainoa Richard. When not servicing clients, Jonathan enjoys family, outdoor activities, traveling back home to Hawaii, and coaching local sports. Jonathan is currently the girls Varsity Assistant Basketball Coach at West Valley High School.